Periodic musings on arts, culture, creative economy and philanthropy issues from the President and CEO of the Bonfils-Stanton Foundation in Denver. You can also follow me on Twitter at http://twitter.com/gsteuer. You would have to be living under a rock to not be thinking about equity these days, and all its related terms/concepts - structural racism, inclusiveness, privilege, etc. Just having the conversation can be a minefield, especially as someone who comes to the conversation from a position of privilege. Am I using the "right" language. Am I being aggressive/forceful enough in my approach? Am I being too aggressive? Will I offend someone by being too timid? Will I offend by being too threatening? If I verbally commit, then what will I actually do to make that verbiage actionable? Those charged with looking at the "big picture" of the cultural life of our communities - service organizations, funders, local arts agencies - have a special imperative to think deeply about these issues and take action, both to examine their own operations for bias and inequity, and to foster these values in the field. Over the past few years Grantmakers in the Arts went through an extraordinarily thorough process of developing, approving and disseminating a Racial Equity in Arts Philanthropy Statement of Purpose. This helped trigger really thoughtful conversations and change in the funding community. Every foundation is different, and many are driven by elements of legacy, history, family control that may limit - or accelerate - such dialogue and change. What the GIA document did was empower foundation staff to at least have the conversation, and have a "field approved" document to help guide that conversation. And most importantly, the document was backed by concrete action. All staff AND trustees were now required to complete the "Undoing Racism" training of the Peoples Institute for Survival and Beyond. A study was undertaken of the entire operations of the organization through an equity lens, special convenings were held, and equity became a thread woven throughout GIA's signature annual conference. And to paraphrase Vu Le's recent Nonprofits With Balls post, equity is not a "track." 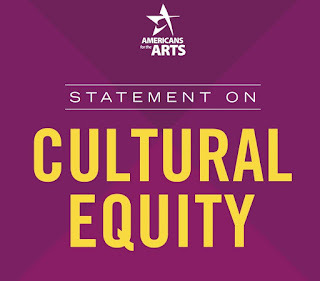 So now Americans for the Arts has just released its "Statement on Cultural Equity." It is an important milestone and something that all who care about the arts should read. It was developed through a long process engaging board, staff and field leaders. Is it perfect? No. Has it been a long time coming - perhaps too long? Yes. BUT, as noted above, fear of not getting it perfect should not prevent taking action, and I applaud Americans for the Arts for taking this step - it is exactly what they need to be doing in leading our field. 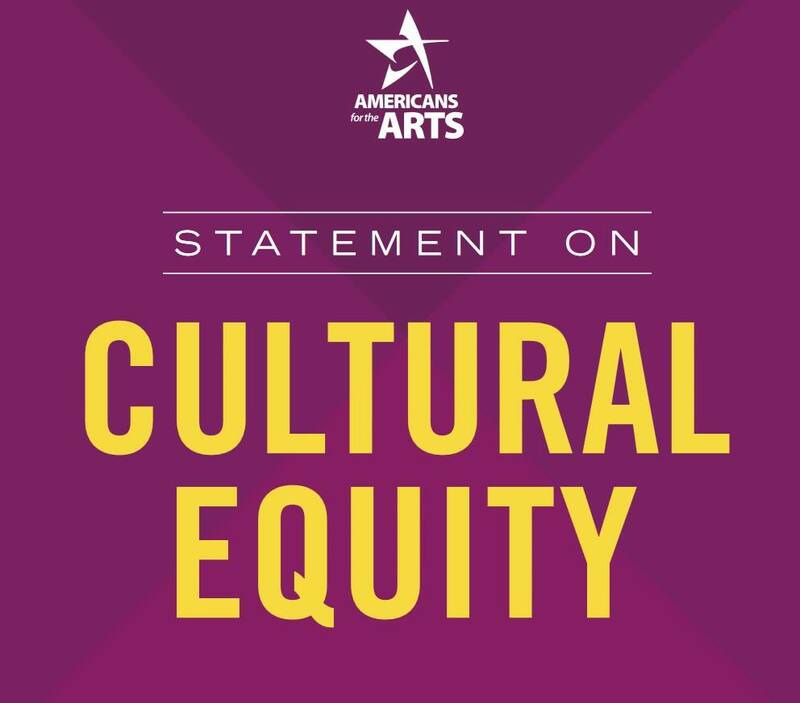 The Statement leads with: "To support a full creative life for all, Americans for the Arts commits to championing policies and practices of cultural equity that empower a just, inclusive and equitable nation." It is my hope that this Statement will inspire others to dig in and make this work a priority, as the GIA statement did. Already, IDEASxLab in Louisville, Kentucky has adapted the Statement for their organization. And Americans of the Arts has already begun to make equity an authentic part of their annual convention and other programs. I think the challenge Americans for the Arts has is that it has a senior leadership team - CEO, COO and eleven VPs - that is entirely White. While there is ample diversity below that level, the fact remains that the face the organization presents to the world with its senior leadership team is not reflective of our society. Having been one of those White faces for a while, I understand the challenge. Virtually that entire senior team has grown up with the organization, many there for ten or even 20+ years, and they are extremely competent and experienced. There is considerable - though vague - language in the Statement about taking specific actions, internally and for the field. So I think for many observers, the proof will be in how the Statement is made actionable - will it shape budget priorities, staffing and board decisions, programming? Americans for the Arts - again, to its credit - has encouraged a robust dialogue in the field around the release of their Statement, opening up their ArtsBlog to an array of other voices, including this thoughtful post by Roberto Bedoya, and this post by Lindsay Tucker So. Other bloggers like Doug Borwick, who writes Engaging Matters, have also written about the new Statement, again encouraged by AFTA. Clay Lord of Americans for the Arts has written a particularly thoughtful blog post on this effort, titled "The Humble Step." I am very sensitive to the situation Americans for the Arts is in, having once been part of the senior leadership team there, and now running a private foundation with an excellent - but not diverse - small board and staff. We do not have term limits which makes achieving a more diverse board a special challenge that will take time and patience. And the staff - which I inherited and is excellent - has not had any turnover so no opportunity to diversify yet. But that does not mean that action is impossible. We were able to expand the board by two "community trustee" slots that are term limited to two years and are designed to add new voices to the board - artists, diversity, youth. Over the past year we added our first artist to the board. and our first trustee of color. And we have taken many specific actions in our programs and funding. The theme of the annual retreat for our Livingston Fellowship Program - a high-level leadership program for nonprofit CEOs - last year was racial equity. It was a very powerful, uncomfortable and moving experience for all the participants - not perfect, and generated much raw emotion - but, again, the conversation started and has only deepened since. We brought in Donna Walker-Kuhne to engage in a series of focus groups with local cultural leaders on how to better serve the full diversity of our community, resulting in a very informative report and the formation of a cultural equity working group that has been meeting regularly to learn, share, and advance this agenda. And we have made equity an important component in our funding decisions, adding grantees or expanding grants to an array of culturally-specific and disability-focused organizations like Su Teatro, Cleo Parker Robinson Dance, Phamaly theatre company and Museo de las Americas. We have also made review of accessibility and outreach and internal equity efforts a part of the review of our general operating and project support grantees. We have made a conscious decision that with our grantees we won't provide special funding for diversity initiatives - to echo Vu's point, we do not believe equity is something you only do if you get special funding to do it. It needs to part of the fabric of how you operate. (The exception is that we may fund special initiatives that benefit the larger community, rather than a single organization, like our work with Donna). These are just a few of the actions we have taken. So I hope the field will not dismiss this Statement from Americans for the Arts because it is not as aggressive as they would like, or uses the word "ability" instead of "disability", or includes fewer specific action items than some would like. As Clay notes, let us all engage in this work with humility, with the knowledge that there is no perfect way to do it, that we are flawed, that many of us bring to the table our privilege, or our hurt and pain at living with bias every day. But fear of difficult conversations, fear of not saying (or writing) the right thing or using the right language, should not stop us from the conversation, the journey. To be honest, the future of the cultural sector, and of our society as a whole, depends on it. Inaction is not a viable option. Thank you Gary for continuing to demonstrate leadership in all that you do. Excellent piece. Gary Steuer is the President and CEO of the Bonfils-Stanton Foundation in Denver. Previously he served as Chief Cultural Officer for the City of Philadelphia and led the City's Office of Arts, Culture and the Creative Economy. He has over thirty years of experience in arts management, philanthropy and policy. The views I express on this site are my own. Alex Hillman's Blog - technology, social networking, etc.